Home /Alexandria Ocasio-Cortezs four-point plan to address gun violence in the U.S.
Alexandria Ocasio-Cortezs four-point plan to address gun violence in the U.S.
After lauding New Zealand’s government for taking gun control action in the days following last Friday’s deadly mosque shootings in Christchurch, New York Representative Alexandria Ocasio-Cortez has shared a four-point plan of her own to address gun violence in the United States. Sharing an article on Twitter on Thursday detailing how teachers in Indiana were left with painful welts and abrasions after being shot with plastic pellets during an active shooter training session, Ocasio-Cortez said that “instead of training children, teachers, houses of faith & concertgoers to prep for being shot,” the U.S. could try taking stronger action on gun control. Ocasio-Cortez’s first suggestion is one that has already gained the approval of her peers in the House of Representatives, with H.R.8, the Bipartisan Background Checks Act of 2019, which sets out to enforce universal background checks, passing through the House last month in a 240-190 vote. While under current U.S. federal law, licensed gun dealers are required to run background checks to ensure that buyers do not have criminal records or a history of mental illness, the rule excludes private sellers. If passed, H.R.8. would enforce new background check requirements for firearm transfers between private parties, closing that loophole for the most part, with the exception of specific firearm transfers, such as a gift between spouses in good faith. According to CSGV, more than half of all women murdered in the U.S. are killed by an intimate partner with a gun, while the chance of being murdered by an abusive partner increases five-fold when a gun is present in the home. “Even when a weapon is not discharged, abusers often use the mere presence of a gun to coerce, threaten and terrorize their victims, inflicting enormous psychological damage,” CSGV warns on its website. However, “despite the clear risk domestic violence presents, state and federal laws still make it far too easy for abusers to obtain firearms,” the organization states. According to the Center for American Progress, among those who are free to buy and possess guns under federal law are individuals convicted of domestic abuse or subject to a restraining order for abusing a dating partner, as opposed to a current or former spouse, co-parent or current or former live-in partner. “This gap in legal protection — which also applies to the purchase and possession of firearms — is colloquially known as ‘the boyfriend loophole’,” CSGV states. Also able to obtain and possess firearms under federal law are individuals who have been convicted of misdemeanor stalking against an intimate partner and individuals subject to a temporary restraining order, the latter being a loophole that many states have sought to close by instituting their own laws to prevent those with temporary domestic violence restraining orders from being able to purchase or possess firearms. Ocasio-Cortez’s call for the U.S. to mandate safe storage comes weeks after a study released last month found that the majority of American gun owners do not safely store their weapons. The study, which was conducted by researchers at the John Hopkins Bloomberg School of Public Health and saw 1,444 U.S. gun owners surveyed, found that 54 percent of gun owners reported that they did not store all of their firearms safely. Researchers behind the study, which was published in The American Journal of Public Health, defined “safe storage” as keeping all firearms locked in a gun-safe cabinet or case, locked into a gun rack or stored with a trigger lock or another suitable lock. As it stands, however, laws on safe gun storage vary from state-to-state with some governments requiring that weapons be kept safely stored away from children and teenagers, while other states do not have specific safe storage policies in place. 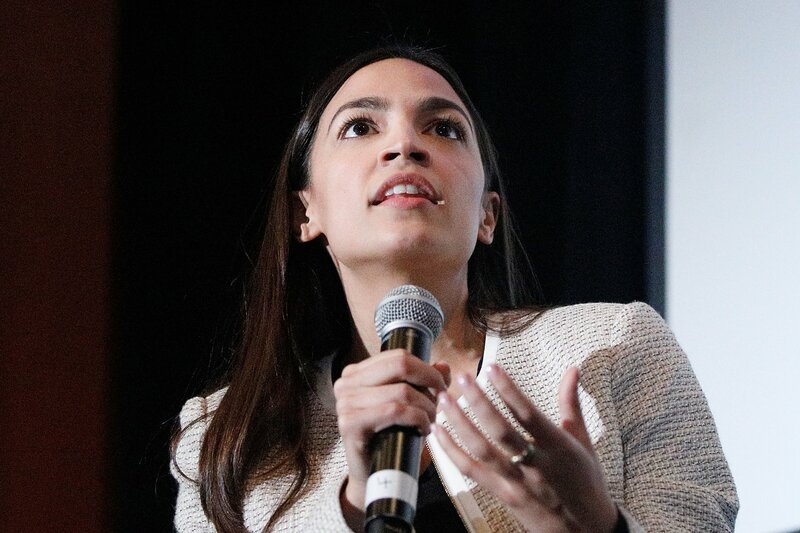 Ocasio-Cortez’s fourth suggestion, to “ban bump stocks, semi-autos, & high cap mags designed to kill people,” mirrors the policies that New Zealand’s government has vowed to put into place in the wake of last Friday’s terror attacks, which saw 50 people killed and dozens injured. In December, the Trump administration did roll out a new federal regulation officially banning bump-fire stocks, which make it easier to fire rounds from semi-automatic weapons, after the devices were used in the 2017 Las Vegas music concert shooting that saw 58 people killed. Those in possession of the devices now face a deadline to turn in their weapons or have them destroyed after they were given 90 days to do so following the announcement of the regulation. Over the past year, the U.S. government has faced growing calls for stronger gun control measures, including bans on semi-automatic weapons and high-capacity magazines, in the wake of the February 14 mass school shooting in Parkland, Florida last year, which saw 17 students and staff killed by a teen armed with an AR-15 rifle. And while gun control advocates have seen some progress with the Trump administration moving to ban bump stocks and some states passing bills raising the minimum age for buying rifles to 21, as well as setting waiting periods and background checks for firearm buyers, the United States has yet to see anything that comes close to paralleling the legislation that New Zealand has vowed to put into place after its first mass shooting in nearly 30 years. Last month, Democrats introduced a bill seeking to ban high-capacity gun magazines, as the one-year anniversary of the Parkland, Florida school shooting approached. H.R.1186, which has been dubbed the “Keep Americans Safe Act,” and which was co-sponsored by Rep. Ted Deutch of Florida and Sen. Bob Menendez of New Jersey, would see any magazine that exceeds 10 rounds of ammunition banned in the U.S. However, with no Republican cosponsors attaching their names to the legislation ahead of its proposal, the bill would likely struggle to gain support in Congress. Earlier this week, Ocasio-Cortez was one of several U.S. lawmakers to praise the leadership demonstrated by New Zealand’s prime minister as Ardern announced that her government would be introducing a ban on all military-style semi-automatic weapons, assault rifles and high-capacity magazines in response to the Christchurch terror attacks. “Sandy Hook happened 6 years ago and we can’t even get the Senate to hold a vote on universal background checks w/ #HR8,” Ocasio-Cortez tweeted, referring to a House bill that would require background checks on all gun sales, including private transactions. “Christchurch happened, and within days New Zealand acted to get weapons of war out of the consumer market. This is what leadership looks like,” she said.